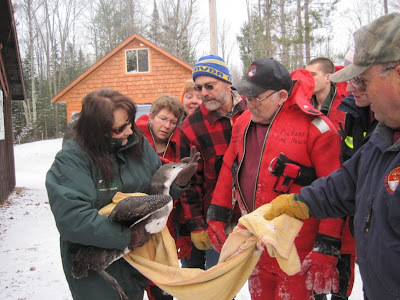 It seems longer than two weeks ago that the Pickerel Fire and Rescue braved the thin ice on Duck Lake to rescue a beautiful adult male Common Loon. The loon we called "Duckie", has been a resident of Duck Lake for many years. The residents of the lake and surrounding area grew very fond of the loon family. The loon odyssey that began on December 8, ended successfully on December 17,2009. 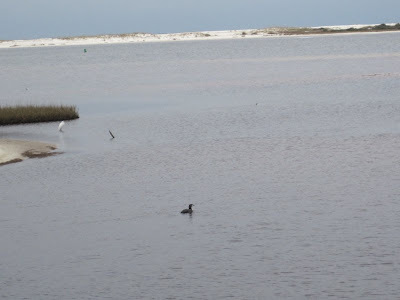 That is when "Duckie" the Common Loon from Duck Lake put his feet in the warm blue waters of the Gulf of Mexico. What a difference nine (9) days made in the life of this loon and those that care about him. 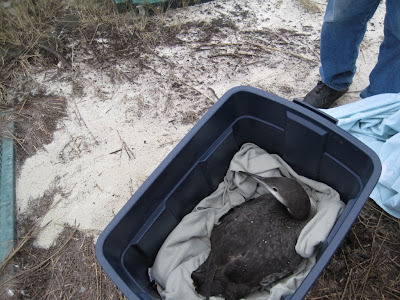 Tuesday December 15, 2009, Don and I decided we would transport this loon to the Gulf of Mexico. Every year we care for loons at REGI that are caught up in lakes icing over. Most are unable to migrate due to lead poisoning. Once the lead is chelated from their blood ( an arduous process at best) the loons just need good food and open water to finish their migration. We have been very lucky in past years to have a generous company, located in Wausau, WI fly loons to southern locations via corporate jet. This loon was different. He suffered a wing fracture in September. It was the wing injury that kept him from migrating earlier. He may fly again, but we could not be 100% certain. Given those parameters he had to be in a place where he could survive well for the remainder of his life IF he was not able to fly back to WI. 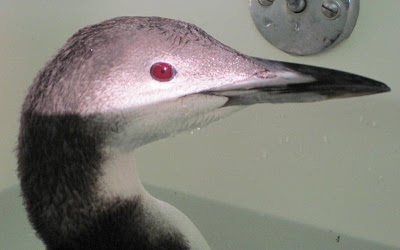 The only place that would work for his long term survival and being able to interact with other loons was the Gulf of Mexico. 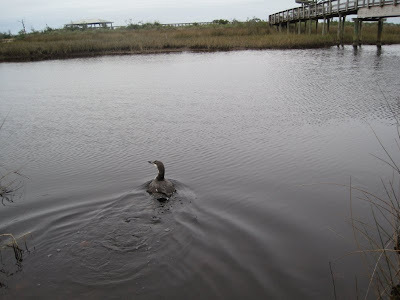 Young loons live in the Gulf of Mexico for the first 4 years of their life before returning to the lakes of the north as adults. "Duckie" would know this body of water well. Traveling 1200 miles cross country with a wild Common Loon in a car is an adventure I am willing to bet not many folks have had. He rode amazingly well in a padded Rubbermaid container, covered only with a sheet to assure ample air exchange and climate control. Our first night was challenging. I filled the tub and put him in along with the first bag of active minnows. All went well except he called that resonant "loon wail" whenever he saw us. We turned on the "nature channel" LOUD and stayed out of the bathroom until he was done eating and bathing. In the morning he had tub time again to eat and swim before we hit the road again. Forty-eight hours exactly from the time we left Antigo we arrived in Pensacola, Florida. This place was chosen in part because it is one of the world's longest barrier islands,. 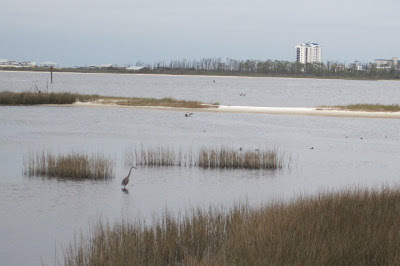 It is also the site of the federally protected Gulf Islands National Seashore. We wanted to make the best possible "second chance" for him. We were delighted with the location. The white sand glistened. A Great Egret and Great-blue Heron were hunting the waters evidence that the fishing was good. But "Duckie" refused to come out of the container. Either he was enjoying the trip or he was in disbelief of what lay before him. Finally after a boost from me he is in the water and begins to notice he is not in Wisconsin anymore. Duckie preened and bathed, dove and fished for about fifteen minutes. He rarely stopped moving or preening the entire time. He was the picture of a happy loon. As we watched he began to move toward the open Gulf of Mexico. He called once and another Common Loon appeared. Then another appeared and together they moved quickly toward the Gulf and out of sight. It was amazing to us how our loon swam so quickly, keeping up with the other loons as he continued to roll and preen. That is the end of the story for now. He wasted no time getting back to the "wild". We could have not had a better result for this release. During the time he was with us at REGI he gained two pounds. When released he weighed nearly 10 lbs which is closer to his normal weight range. He weighed slightly over 8 lbs when admitted. And the biggest news is he can FLY. He did fly but not far. I have great hope that with excercise he will fly again. The real end of the story will come in the spring. We will be waiting to see if "Duckie" returns to Duck lake in the spring. The residents of the lake will keep us informed. We wish him the best of luck on this newest phase of his life. 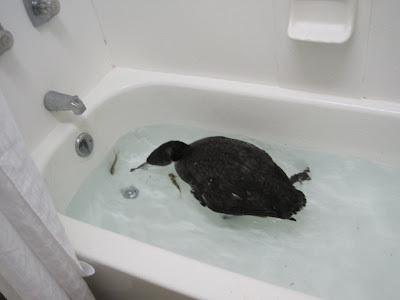 I like to think of Duckie this holiday season celebrating his freedom and second chance at life. Thanks to everyone that helped with Duckie. It takes a village to make a difference and it certainly did in this case. For those blog readers just joining this story. Please check the dates from December 8th for Duckies entire story.